How Goals work - by Paul Ziino – WELCOME TO OUR INTERNATIONAL SUPPORT! We receive calls all the time asking for assistance with customers’ Rule Trees. A common question is “what’s the difference between rules and Optimum Goal Scheduling™?” Today, I will shed some light on that very topic. For starters, the biggest difference is that Goals are not Rules. A Scheduling Goal will not cause an unscheduled position in your log whereas a rule potentially could (assuming it is unbreakable). Goals do not prevent anything from happening, rather goals work like tie-breakers. It is not a bad idea to use both rules and goals in your rule tree. Before MusicMaster for Windows, music schedulers basically worked on the premise of “once we find a song that passes the unbreakable rules, schedule it”. With the introduction of Optimum Goal Scheduling™, MusicMaster is able to take scheduling to the next step and actually help the user by finding the best available song based on certain criteria—beyond what the unbreakable and breakable rules dictate. For example, let’s assume we’re scheduling a category and there is only one rule in place—Minimum Rest—it is Unbreakable and set at 5:00. Let’s also assume that we have one Scheduling Goal in place in this category—Optimum Song Rest. 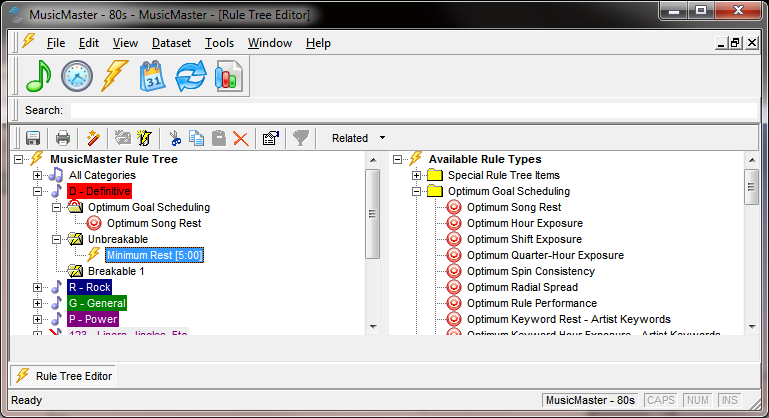 For our example, we’ll say the category has a depth of 5 set up in Schedule Properties meaning that MusicMaster can look at the first five songs in the stack to find one to be scheduled. Song 1 is considered by the Automatic Scheduler and has rested 3:00, thus it fails the 5:00 Unbreakable Minimum Rest rule and is no longer considered. Song 2 in the depth has rested 4:45 so it also fails that rule. But let’s assume that songs 3, 4, and 5 have all exceeded the 5:00 minimum rest rule. Without the Optimum Song Rest goal in place, MusicMaster would have tested song 3 and scheduled it without considering songs 4 or 5. 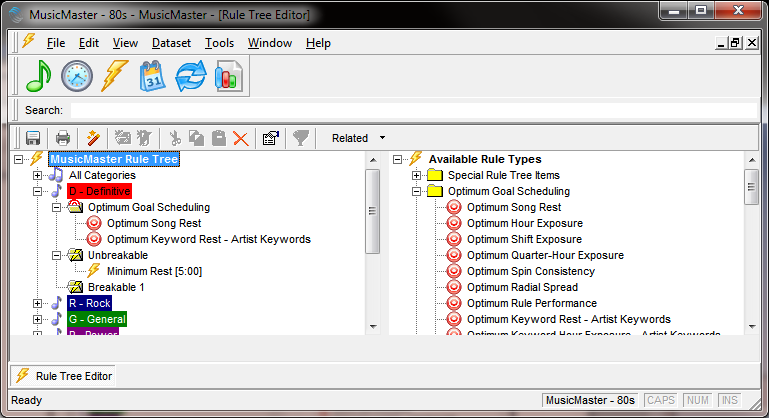 With the goal, MusicMaster tests all the songs in the depth in an attempt to find those that are equally “best available” based on the rules. In this example, that’s three songs. So now those three songs are re-tested against the Optimum Song Rest goal to determine which is best in an attempt to break this three-way tie. Now MusicMaster does some magic behind the scenes to determine the optimum amount of rest we can expect for this category. Let’s say for our example that is 10:00. So song 3 is put up against the Optimum Song Rest goal and it’s determined that it has rested 7:00. Song 3 now gets a score of 70% (7:00 is 70% of 10:00). Song 4 has rested 9:00 and gets a score of 90%, and song 5 has rested 8:30 and is scored at 85%. The result would be song 4 is scheduled as it had the highest score against the goal in place. Let’s take this a step further. Let’s say 10:00 is still the optimum amount of rest for our category. Song 3 has rested 7:00 and has a score of 70%. But let’s say song 4 has rested 11:00 and song 5 has rested 13:00. Both songs 4 and 5 would receive a score of 101%–once a song has exceeded the goal it doesn’t get bonus points for being an over-achiever. So now we still have a tie between songs 4 and 5, so what happens? If no other goal is in place, song 4 would be scheduled as it was the first of the two songs to be considered. But if there’s a second goal in place– Optimum Keyword Rest-Artist Keywords–those two songs would then be tested against that goal. With Keyword Rest goals, MusicMaster does even more behind-the-scenes calculations in determining the optimum amount of separation which can be expected for every keyword, in this case Artist Keywords. Let’s say we’re scheduling a classic rock database. In our example above, song 4 is “Black Dog” by Led Zeppelin and song 5 is “Bohemian Rhapsody” by Queen. As MusicMaster is considering these two songs against the goal of Optimum Keyword Rest, it determines that the optimum separation value for keyword LED ZEPPELIN is 3:00 and for keyword QUEEN the value is 5:00. Looking at the keyword’s history, we see Led Zeppelin played 2:00 back, so “Black Dog” gets a score of 67% (2:00 is 67% of 3:00). And looking at the history of QUEEN we see we last played a song with that keyword 3:00 back and thus “Bohemian Rhapsody” gets a score of 60% (3:00 is 60% of 5:00). The result is that “Black Dog” would be scheduled since it has achieved a higher score. If there’d have been an unbreakable Artist Keyword Time Separation rule of 4:00 in place for our category, neither of those songs would have passed, and then neither would have been tested against the goal. When using Optimum Goal Scheduling™ in conjunction with rules, think of the unbreakable rule as your bare minimum setting and the goal as a way to get even more. You can have as many goals in place in a category as you see fit…but the order in which those goals are listed determines their use in tie-breaking. So if you’d rather MusicMaster pick a song that best achieves Artist Separation, make that the first goal. If you’d prefer MusicMaster pick a song that has rested the most, make that your first goal. And, once the tie is broken, the remaining goals are bypassed and the song with the highest score is scheduled. 1) For categories with a depth setting of 1, Optimum Goal Scheduling™ will have no effect as there will be no tie to be broken when the Automatic Scheduler is only looking at a single song. 2) After testing songs against the unbreakable and breakable rules, if only one song is deemed “best available”, Optimum Goal Scheduling™ won’t be considered at all since no tie would need to be broken, and that one “best available” song would be scheduled.